Sophie-Do-It learns to sew. 4 year old turned a heart shaped pillow cover right side out; filled with stuffing then sewed the opening close. Of course it looked like a 4 year old sewed the pillow…and No Non-cents Nanna is so proud! 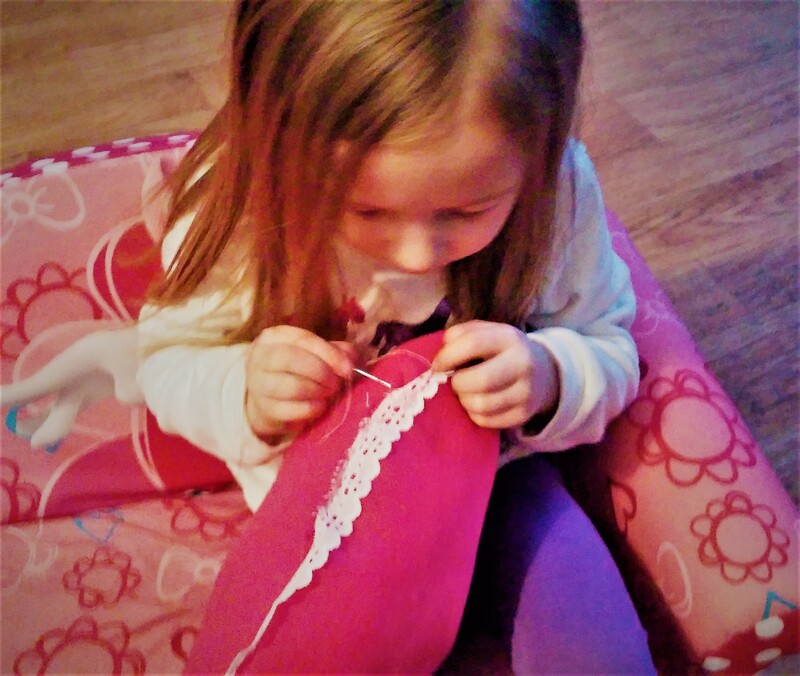 Do you or your kids know how to sew on a button or mend a ripped hem on your skirt? Can they thread a needle? Perhaps you always wanted to learn to embroider a gift? Well, stop putting off learning this basic skill. Plan to learn to sew this Spring Break, Summer vacation or Winter Break. How about after school instead of mindless vegging out with video game? So You Want to Get Rich Selling On-line: News You Can Use!